It seems that there is quite a bit more to Harvest Blooms than I first thought. There is quite a lot of detail. I am a little disappointed in the coverage of Black Crow (Sampler Threads). I used it for the boot. It seemed a little sparse even with 2 strands. It was a bit tedious just stitching in black for ages and ages! Now I am finishing up the flowers and bittersweet. They are fun. I like how they are turning out. The border will take some time though. 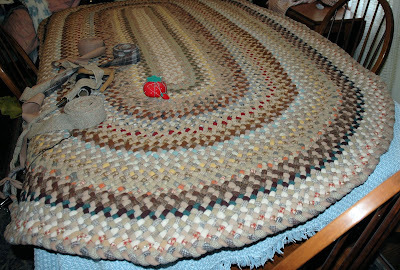 Otherwise, I have started working on my rug again. Progress on that just creeps along inch by inch. The slow part is in the preparation of the rolls. It measures about 4 feet 5 inches wide by 8 feet long. I wanted it to be about 8 by 12, but somehow it has not grown uniformly and I will have to adjust my expectations! It was hard to get a picture of this, but this will give you an idea. As you can see, it has completely taken over my dining room. I have it on the table and I can only work on half of it at a time. Then I have to re-position it to work on the ends and the other half. It is getting heavy too! Harvest Blooms looks great Erica. I love the colour of those flowers. 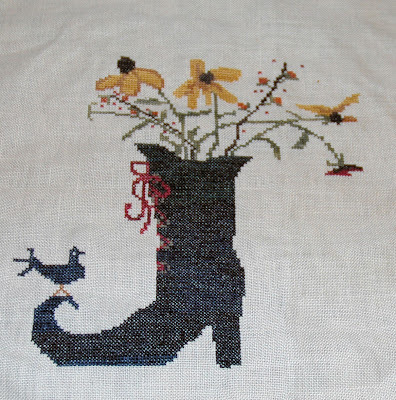 Nice work on your Harvest Blooms and the rug. I have found that when doing black using almost any thread that I must use 3 strands where I normally would use 2. I am doing the "Smell My Feet" from the JCS Halloween ornament issue and am using 3 strands of WDW Mascara to get better coverage. That rug is going to be awesome. Harvest Blooms is really cute. And look at your fabulous rug, wow! Your Harvest Blooms is beautiful! I love the flowers in this piece. 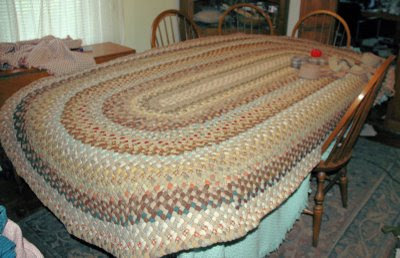 Wow, this is very amazing to see that you are making a braided rug! It's gorgeous - love your choice of wools! What an accomplishment this will be.